YOU MUST SEND US AN AMAZON MESSAGE WITH YOUR COLOR(S) CHOICES. YOU CAN PICK UP TO 15 DIFFERENT EASYWEED COLORS, ONE YARD MINIMUM PER COLOR. IN CASE WE MISS YOUR MESSAGE WE WILL CONTACT YOU VIA AMAZON MESSAGE REQUESTING YOUR COLOR CHOICES. PLEASE CHECK YOUR AMAZON MESSAGE CENTER FOR ANY COMMUNICATION. Siser EasyWeed is a polyurethane, ready-to-cut material designed for custom garment decoration. Here's the heat transfer video flex vinyl that lets you cut logos and lettering with the unique look. Very easy to weed (remove) waste vinyl. Excellent stretchability. Please, send us an Amazon message with the colors you want, you can mix and match! **ONE YARD MINIMUM PER COLOR! 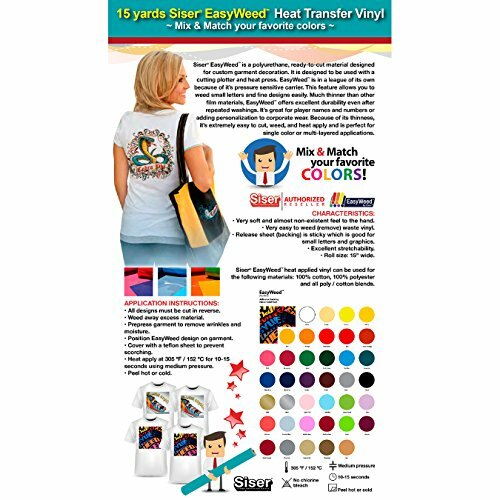 NO NEON OR GLITTER COLORS WITH THIS LISTING ONLY EASYWEED** Send an email using contact us in Amazon with the colors you would like to receive. If you have any questions about this product by GERCUTTER USA, contact us by completing and submitting the form below. If you are looking for a specif part number, please include it with your message.